It's that time of year again!! Blogger's Quilt Festival is one of my favorite events. 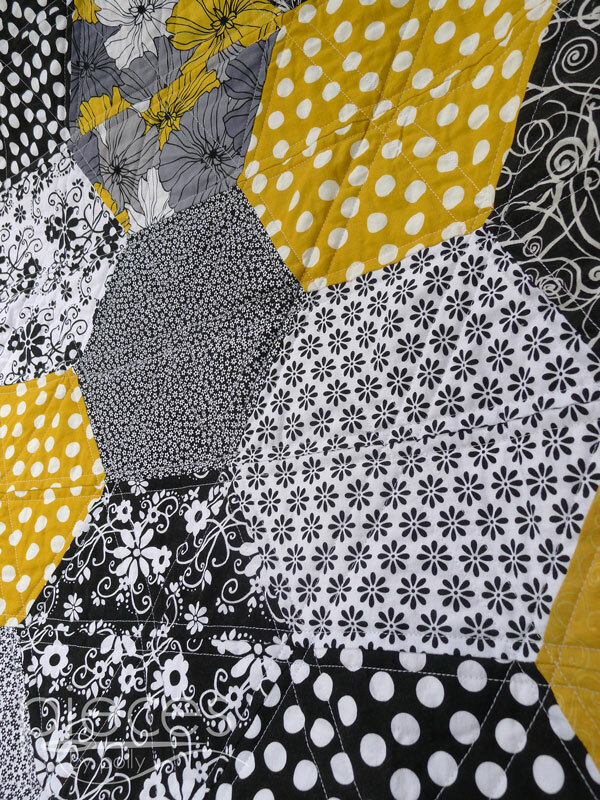 I knew this quilt had to be one of my Blogger's Quilt Festival Entries. The hard part was really just deciding which category to enter it in. It could have gone for a throw quilt, home machine quilted, or I'm thinking it might have enve counted as a two color quilt...but I've decided to enter it in the Quilt photographer category. 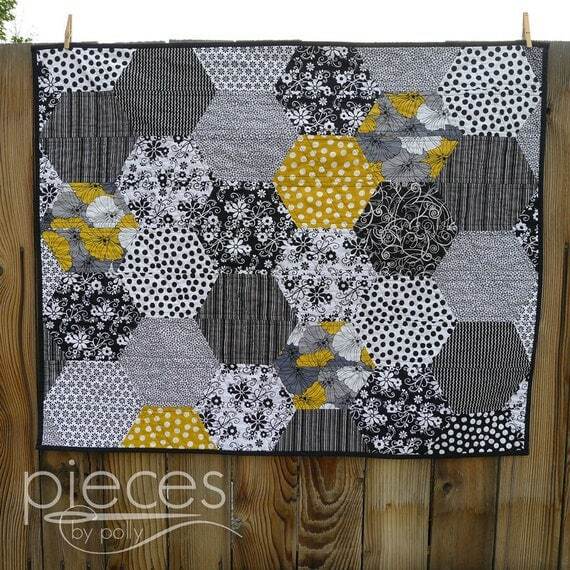 I've really fallen in love with this Giant Hexies by Halves pattern. I've designed lots of my own quilts, but this is the first one that I've taken then the time to thoroughly write up into a polished pattern. It's available here in my shop and if you enter QUILTFESTIVAL20, you'll receive 20% off the purchase price of the pattern (offer expires Nov. 8, 2013). I've already made 4 quilts using this pattern and every time I'm reminded how easy the pattern is. great quilt, and fab photos. I especially like the one with it in the mailbox! We don't have such pretty things in the UK! Your photos have really done a great job of playing up our beautiful quilt. The colors are outstanding. 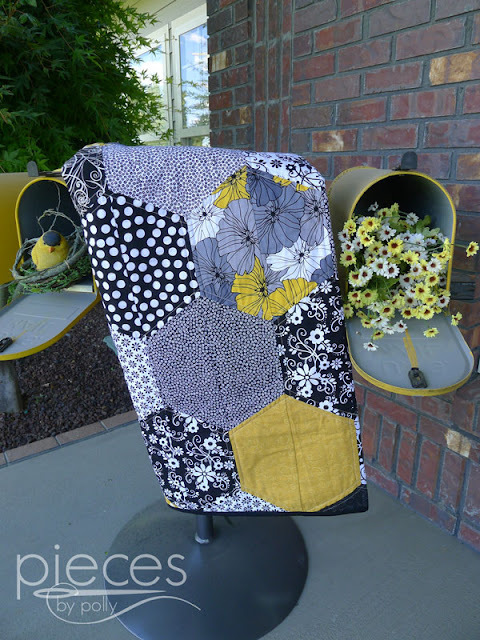 Polly - I love both these quilts and I especially like the mailbox display with daisy bouquet! 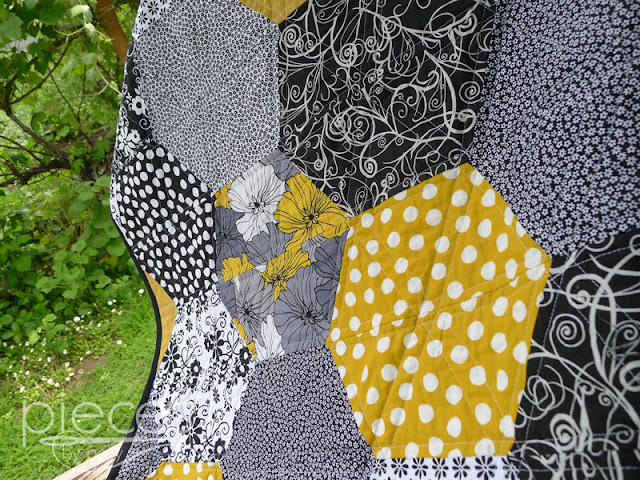 I want to make a red and black two color quilt - it's on my list! Love your photos, your quilt is fabulous!! I love the picture in the mailbox! 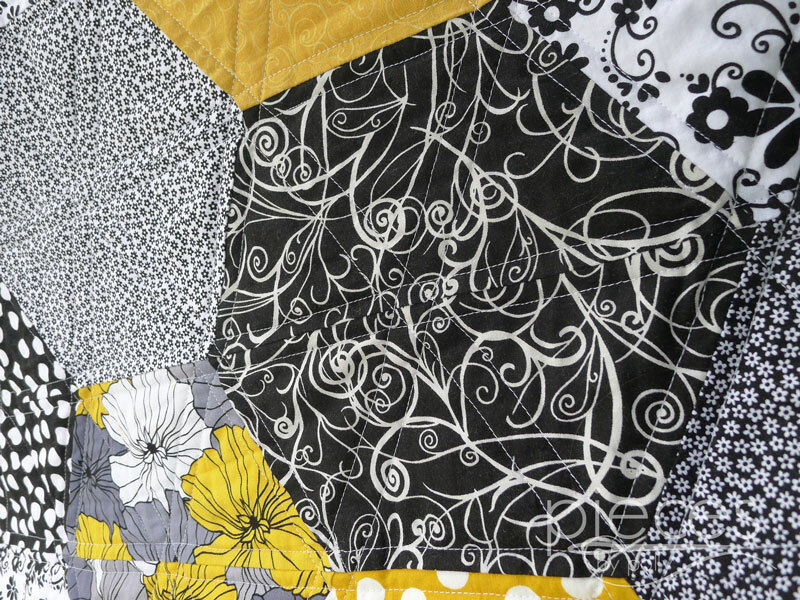 Fabulous quilt and great photos. The one in the mailbox is super cute! Cheerful pics of a very cheerful and sweet quilt! Are those mailboxes on your patio, decorative? That photo in the mailbox is great!! 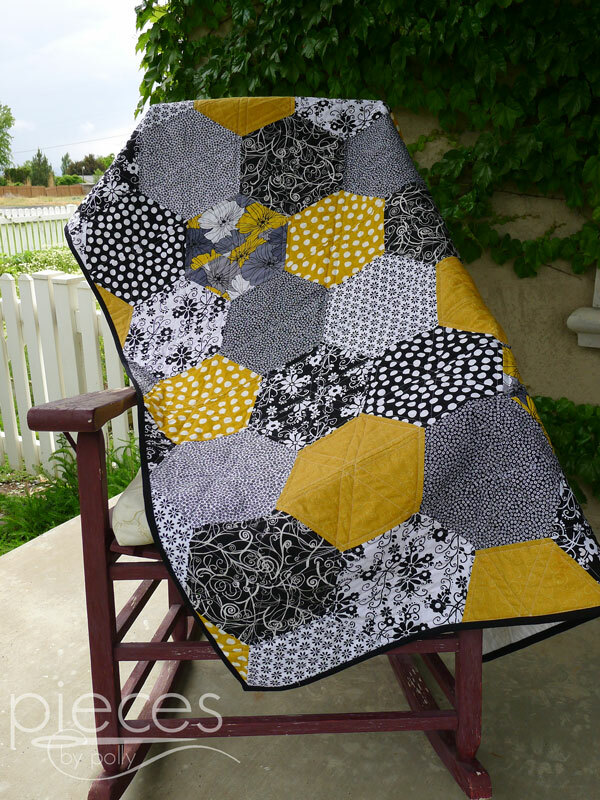 Cute giant hexies! Such a lovely gift! Beautiful quilt! 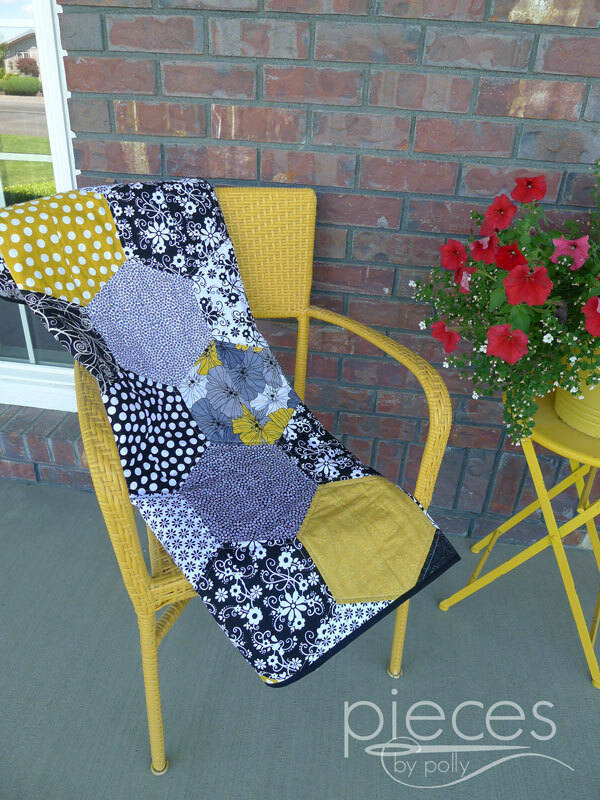 Very cute quilt and fun photos! Ha ha, the mailbox picture is fabulous! You know you can send the quilt to me, if you think it needs some "airmiles"! ;-) I LOVE it!!! The black and gold fabrics are beautiful combination. I love your photos in the letter box! especially the way you've put flowers in some of the boxes. 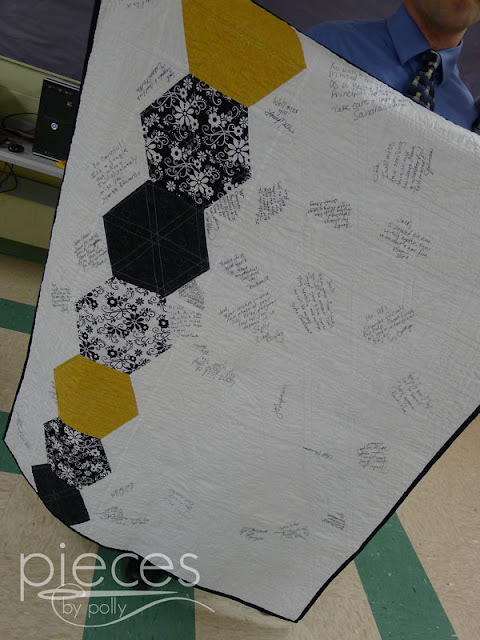 Gotta love a giant hexie quilt! Beautifully done! 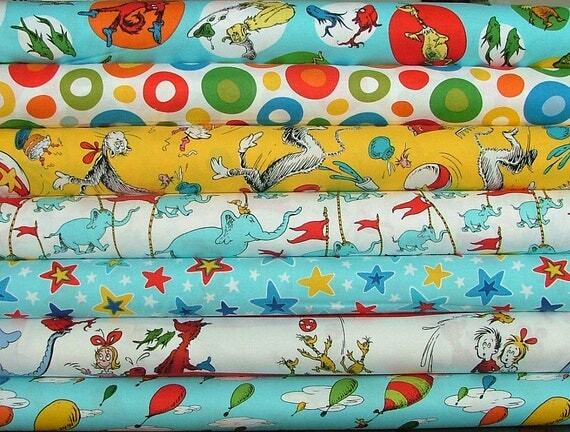 Super cute quilt for a wonderful purpose. LOVE the mailbox photograph.